I have to come up with some new frugal things to do as well. Bake bread more often. I have a bread machine so it isn't difficult. The no name bread is up to $2.49 a loaf now. Make matching placemats instead of buying new (using fabric I already have). Start using rags more instead of papertowels for spills and such. Find a local farmers market (in a couple months once they open) and compare prices to grocery store. In the past couple of weeks we have stocked up on several sales. Cereal - a few different kinds that we all like. I am planning on doing more baking/cooking and freezing too. What are you doing to save a buck, stretch your dollar or make do? Great post! We do alot of the same things you have listed. 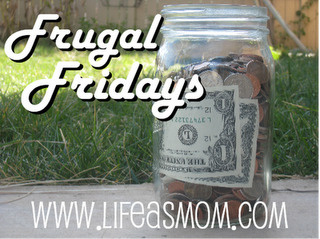 This is a wonderful list of frugal ideas! This is a great collection of ideas. Thanks for sharing it! 3. TURN OFF THE COMPUTER NOT! 3. We are on a "vow of poverty"
We started shopping with cash only--this has made a big difference. Truly this is actually the biggest change we've made recently. We've also been looking into ways to simply increase our income a little bit, since we've pared down to only the bare essentials already. We do a lot of the same things, too. :D Great post! That's funny. My list is almost identical to yours! I'm on my last roll of store-bought paper towels. We use cloth napkins. We clean an office building and get to take home the paper towel roll ends. Not soft enough to use for napkins but work great for spills etc. You sure are making a great effort! BTW, did you know you can freeze butter? I stock up when it is cheap and try to keep several boxes in the freezer, and one in the fridge. Farmer's markets...sigh...I can't wait until it is warm enough for them to open again!